Cape Report: Unemployment a 'post-apartheid phenomenon' in SA. SA's unemployment rate rose from about 7% in the mid-1970s to 13% in the mid-1990s and 25% in the late 2000s. "To the South African government this is an inconvenient fact, since it implies that current high levels of unemployment are largely a post-apartheid phenomenon and not, as many officials and academics would prefer it, a legacy of apartheid," recruitment company Adcorp said on Monday as it released its employment index for June. Adcorp said the acceptance that unemployment had current rather than historical causes was the necessary first step in fixing the problem. "So long as we cite historical causes, we live in a fantasy world where unemployment can only be addressed when the legacy of apartheid itself is finally addressed. Turning to the question of whether or not unemployment in SA could be fixed, the company said this would largely entail (a) unravelling the post-1994 changes that have caused the unemployment rate to nearly double over that period; and (b) bringing millions of informally employed people into the formal sector. "This essentially requires revising two areas of the Labour Relations Act of 1995, namely collective bargaining procedures and protections against dismissal." According to the World Economic Forum... SA's labour laws and regulations ranked 133rd (the seventh lowest) among 139 countries in the world, particularly in three areas: hiring and firing practices (135th), conflict in employer-employee relations (132nd) and flexibility of the wage-determination process (131st). All three areas were governed by the Labour Relations Act, Adcorp said. Apartheid was regarded as a capitalist system designed to suppress wages and working conditions for black South Africans. "As the Free Market Foundation argues, apartheid was neither capitalist nor market-oriented, nonetheless, labour market reform - more so than the Constitution itself (which was introduced only later, in 1996) - was an overriding objective of the new coalition government." However, the industrial peace to which the Labour Relations Act aspired failed to materialise, Adcorp said. "In 2010 there were more working days lost due to strikes and work stoppages than at the peak of 'rolling mass-action' under apartheid. 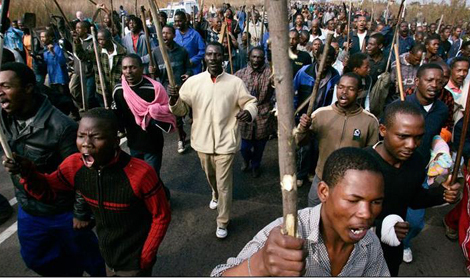 "....SA will lose 24.9 million days due to strikes and work stoppages in 2011 - an increase of 22% over 2010." "As the World Economic Forum notes in its 2010 Global Competitiveness Report, SA has the eighth-highest level of industrial conflict in the world - despite having, in the South African government's view, some of the world's most progressive labour legislation." Adcorp contended that the Labour Relations Act had moved SA backwards rather than forwards. "Firstly, dismissal protections - which make it exceedingly difficult to fire workers who fail to perform or even to show up for work - have made falling labour productivity an endemic rather than occasional or isolated problem. "...SA's hiring and firing practices rank the fifth-worst in the world." Secondly, the collective bargaining process - which gave significant power to trade unions and bargaining councils - had allowed two-digit wage escalations to co-exist with falling labour productivity. "...SA's wage determination process is the ninth-most inflexible in the world. The inability to get workers to perform, and the inability to pay them for their performance, are the single biggest drivers of low employment, which in turn is the primary cause of high unemployment." As a result, big and small employers alike were considering how to mechanise, automate and generally do away with labour: the labour intensity of production for SA as a whole had fallen by 16% since 1994. Employment had dropped sharply at an annual rate of 8.3% during June, the second consecutive monthly decline. This represented a loss of 127,100 permanent positions and 5,712 temporary positions.